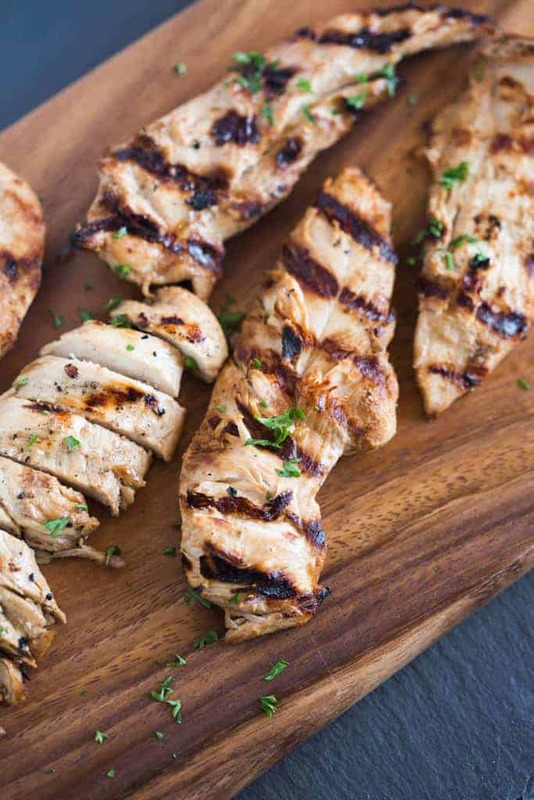 Everyone always RAVES about this delicious (and super EASY) chicken marinade. Just a few simple ingredients and you’ve got the perfect marinade for summer grilling or even cooking in the oven during cooler months. If I were one of those recipe snobs who kept their favorite recipes under lock and key, then this recipe would definitely be declared TOP SECRET. But the fact that it’s such a special family recipe makes me want to share it here even more! I can say with total confidence that it’s my favorite chicken marinade recipe of all time! My mom has been making this recipe for as long as I can remember. Anytime she brings someone dinner, this is usually on the menu. Whenever she’d make dinner for our soccer or basketball team dinners, she’d make this. Whenever we would BBQ during the summer, this was a dinnertime staple. I don’t think I’ve ever been around when she served this and people didn’t ask for the recipe. The flavor of the chicken is soo delicious, and everyone always loves it. The perfect family-friendly meal that your 2 year old will enjoy as much as the adults. This recipe would make a great freezer meal. To freeze, place all marinade ingredients in a ziplock bag and shake the bag to ensure they are well mixed. Next add the raw chicken to the bag and place the bag laying flat in the freezer (once it’s frozen it will be easier to store this way). Allow the chicken to thaw in the fridge before using. These chicken tenders are the perfect for cooking on the grill! They cook fast and can be seasoned with all types of spices and marinades. 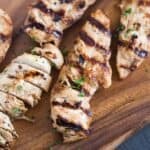 This grilled chicken marinade is my go-to for a quick weeknight dinners or when bringing dinner to a family. Simply leave the chicken in the marinade for 1-3 hours, lay them on a hot grill, and cook them for a few minutes on each side. See my tips below for the perfect grilled chicken. You can use chicken tenders, breasts or thigh meat for this recipe. I usually use chicken tenders because they cook really fast–perfect for hungry, impatient, kids 🙂 . I will often thread the raw, marinated chicken tenders onto skewers (like these) and cook them on the grill that way. That’s how my mom served them to use as kids and they’re really fun to eat that way. Don’t leave out the horseradish! It may sound like an interesting ingredient, but I promise it wont make the chicken “spicy” at all–it just adds an amazing flavor that blends perfectly with the soy sauce and the tang of the sprite. Make sure to cook the chicken on medium heat (about about 375-450 degrees F). Don’t go hotter than 450 degrees F to avoid drying out the chicken. 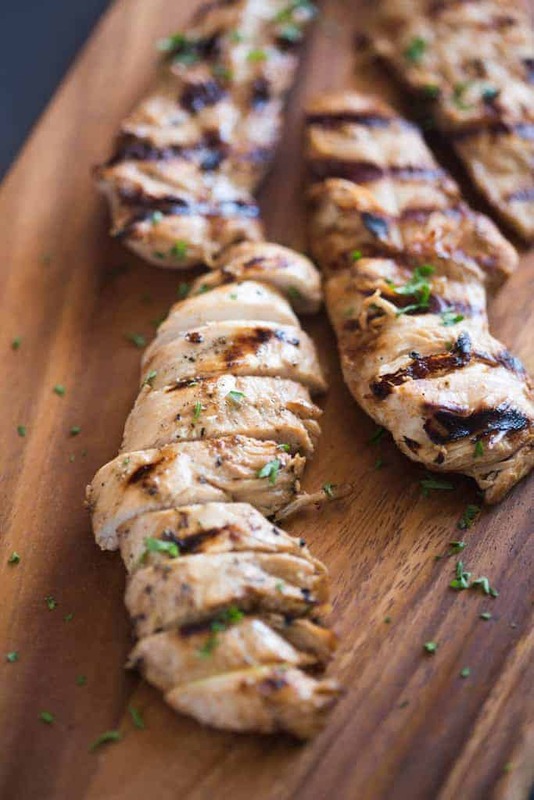 Hope you enjoy my favorite grilled chicken marinade recipe of all time! Everyone always RAVES about this delicious (and super EASY) marinated chicken recipe! Just a few simple ingredients and you've got the perfect marinade for summer grilling or even roasting in the oven during cooler months. Add soy sauce, oil, sprite, garlic powder and horseradish to a large ziplock bag. Add chicken and marinate for 1-3 hours. Heat grill to medium. Spray with cooking spray or rub the grill grates lightly with oil. Lay chicken on the grill and cook for a few minutes on each side, flipping only once, until cooked through. (I don't typically use a thermometer, but if you do, the chicken should be 165 degrees F at its thickest part). Move to a plate to rest for a few minutes before serving. Thank you for posting this recipe. Can we leave overnight to marinate? We made this last night and marinated boneless skinless chicken breasts. The chicken was delicious and so moist. Thank You for so many great recipes.